The Women’s Christian Fellowship of Central Congregational Church invites all interested adults – men and women – to attend an important, informative presentation titled “Dementia Friends” presented by Pam MacLeod from the Massachusetts Office of Elder Affairs. Join a growing movement of people like you who are helping fellow community members living with dementia. A little support can make a big difference. Be a Dementia Friend! What Makes You a Dementia Friend? 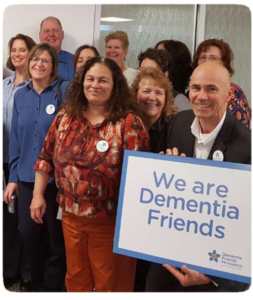 You become a Dementia Friend by attending a one-hour informational session to learn about this worldwide movement, about living with dementia, and the simple things you can do to support someone living with the disease. What Happens at the Information Session? The one-hour session is a discussion led by a Dementia Friends Champion. It is not a training session. You’ll learn what dementia is, what it’s like to live with the disease, and some tips for communicating with people who have dementia. Everyone who attends is asked to turn their new understanding of dementia into a practical action that can help someone living in your community. The action can be as big or as small as you choose—every action counts! You don’t need to be a dementia expert to become a Dementia Friend. You don’t need to know someone with dementia to become a Dementia Friend. Dementia Friends is a global movement that is changing the way people think, act, and talk about dementia. Developed by the Alzheimer’s Society in the United Kingdom, the Dementia Friends initiative is underway in Massachusetts and across the United States. By helping everyone in a community understand what dementia is and how it affects families, each of us can make a difference for people touched by dementia.